Dr. Courtney White completed her undergraduate career at Michigan State University and went on to earn her Doctorate of Veterinary Medicine at the Michigan State University College of Veterinary Medicine. 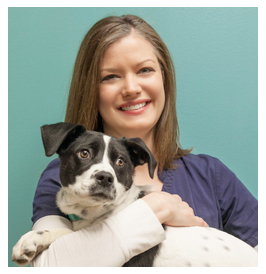 Following graduation, she completed an internship at Michigan Veterinary Specialists and later trained at the University of Tennessee College of Veterinary Medicine where she received her certification in canine physical therapy. Outside of work, Dr. Courtney enjoys spending time with her husband and three children. Her family has two dogs, that have both been adopted from HSHV, a guinea pig, and a bearded dragon.